The Dual CamJam Tie Down System has been masterfully engineered to secure and lock down your equipment and gear. The innovative Dual CamJam buckle features not one but two cam locking mechanisms, one on each end of its zinc alloy body. 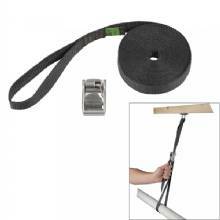 The system also includes a high density 1" polypropylene webbing strap with an integrated bar tacked loop on one end. With the buckle independent of the strap and completely adjustable, this innovative system is the most versatile tie down you'll ever use. This system can be used in two ways: a fixed end configuration or a traditional loop configuration. Watch our How To video in the video tab above to see them in action. In the fixed end configuration, the integrated webbing loop allows for easy attachment of the strap to an anchor point while the loose end can be placed over or looped around your gear and around the other anchor point. One unique advantage of the Dual CamJam is that Cam 1 allows you to easily slide it onto the webbing and to adjust the buckle placement easily and securely within your configuration. Then complete your configuration by wrapping the strap around your load and other anchor point and insert the webbing end through Cam 2 to easily tension the load in place. This set up uses half as much webbing as traditional tie down straps which function in a looped configuration. The other major unique advantage of this configuration is that you are able to create a 3-to-1 mechanical advantage. For example, you only need to apply 50 pounds of force to achieve a 150 pound result - a great advantage over using more complicated ratcheting cam straps. With a break strength of 1200 pounds and a working load limit of 400 pounds you can count on these straps whether hauling small or large items. So hang your hammock, lock down 2x4's, or strap down your kayak with the versatile and strong Dual CamJam Tie Down System.